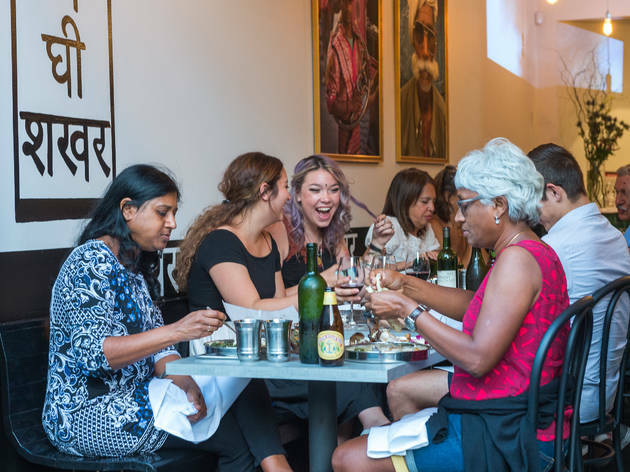 The state of Indian food in New York is a divided one. There’s plenty to choose from, sure, but options are situated at two ends of the spectrum: Cultish, rickety dosa carts, home-cooked Punjabi counters and tandoori diners in far-flung pockets like Jackson Heights occupy one end; modern, Michelin-level fine-dining rooms—your Junoons, your Tamarinds—gloss up the other. Babu Ji, a south Melbourne import from husband-and-wife team Jessi and Jennifer Singh (from Chandigarh and New York City, respectively), falls comfortably in the middle. 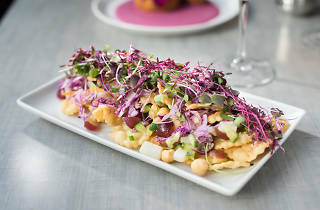 There’s a tasting menu, but it’s only $50 per person; a thoughtful wine list but also a fend-for-yourself beer fridge. Silver-haired dadimas are parked on sleek black banquettes next to ball-capped millennials as taken with ’gramming the meal as eating it. 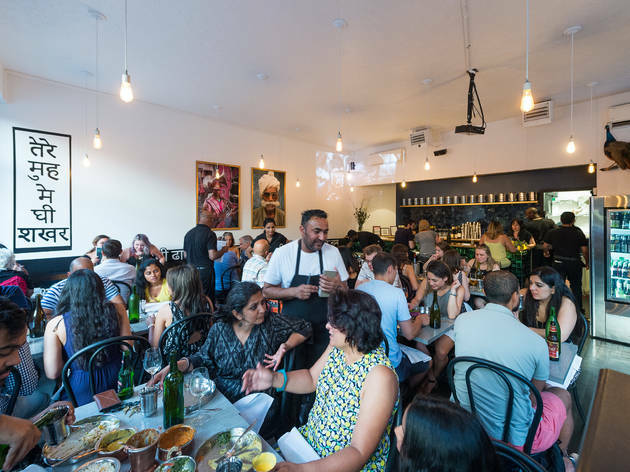 And those picturesque plates are similarly middlebrow— slow-cooked lamb folded into a Kashimiri-style rogan josh ($20), raw Long Island scallops dropped into turmeric-yellow coconut curry ($25)—heartily accessible but more pristinely garnished than your hole-in-the-wall curry house. The opening “from the streets” section features papadi chaat (India’s answer to nachos; $14), with mini papadum crisps rendered Mediterranean-breezy courtesy of tender chickpeas, tart pomegranate seeds and tangy yogurt chutney; and yogurt kebabs ($14), crispy hung-curd croquettes that are belly-bombing dense but have a nice rolling spice thanks to a pool of beetroot ginger sauce. Small brass crocks of sweet, free-range butter chicken ($24) and fresh pomegranate kofta in cashew-shallot curry ($16) are ushered out next with puffs of garlicky naan and bowls of cumin-laced basmati rice in tow, faintly spiced (too timidly for true-blue heat seekers) but satisfyingly creamy enough to make up for the portion and price. But it’s the superb kulfi (Indian ice cream pop) that sums up Babu Ji’s intentions. The process is laborious—the milk base stirs with cardamom, pistachio and honey for six hours, and the traditional conical molds are shipped in from the motherland—but the effect is infectiously fun, with diners rolling the ice-cold metal casts between their hands before the chewy confections slide out. Babu Ji is polished, but it’s not above playing with food. My friend was devastated when the first location closed, and now that I've finally been here - I get why. The General Tao's Cauliflower is my new favorite appetizer, and I don't think I'll have butter chicken that delicious ever again (or at least until I go back). Make sure to go on the earlier side so you can walk in without a reservation. And definitely bring two or three people with you so you can split dishes as a group! the chicken was deliiiiicious - it's soft and tender and melts in your mouth. the chicken is on the spicy side, but the white sauce and naan makes for the perfect taste. the coconut shrimp curry was a little sweet, but definitely still a nice dish to try. The best Indian food I've ever eaten is at Babu Ji. 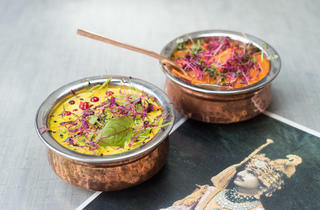 I'm not adventurous when it comes to Indian food (sticking always to the same two entrées) but Babu Ji, with its beautifully plated dishes, forces you to try something different. 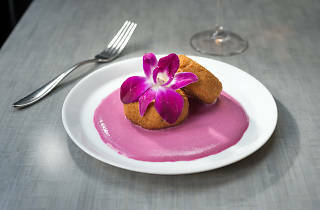 I loved the cheesy fritter over a spicy beet sauce, the vegetable korma and buttery naan. It was remarkably busy for a weekday but the host squeezed us in even without a reservation, so don't be discouraged if you walk by and see a line that wraps around the corner. Give it a try! 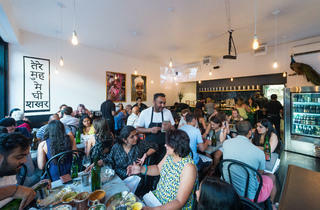 Babu Ji is hands down making some of the most carefully crafted Indian good out there. Came here for the second time last night and tried their tasting menu. 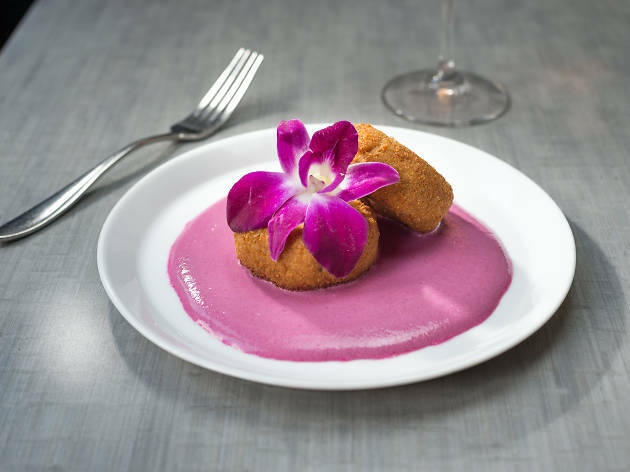 I was initially skeptical as tasting menus are very hit or mis - in this case, no miss. 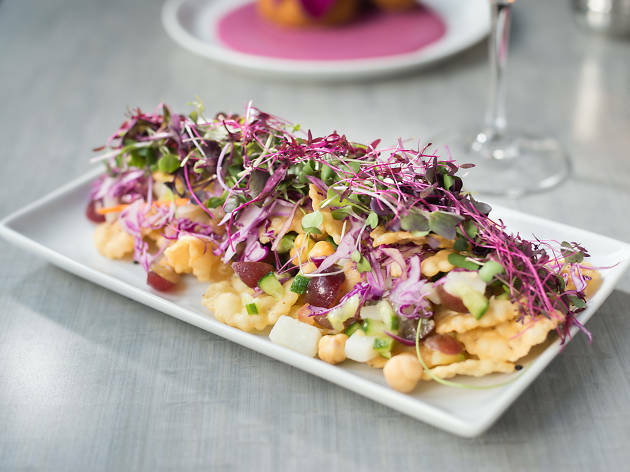 For $62 you get a wide variety of samplings of what the restaurant has to offer, and you can even pair the tasting up with beer ($22) or wine ($30). Cardamon pistachio ice cream - i can't even begin to speak about this because i'll freak out. Best serving of ice cream i've ever head. Get here ASAP!!!! The staff is nice, the ambiance is super cool, and it's just straight up DELICIOUS. If you're a friend of mine visiting from out of town, I'll probably suggest we go here. My trendsetting globe-trotting friends loved it. My parents loved it. Local friends love it! The chef/owner seems to be everywhere at once - checking on the tables, greeting guests at the door and making dreamy dinners in the kitchen. The Colonel Tso's Cauliflower is something I think about between visits. The cardamom ice cream pop - freezing cold but ready to melt - is the perfect way to end a meal. Try the tasting menu if you've never been and want to make the most of your meal You'll be full and happy. *Update: I went back again last night for the tasting menu and I loved the place even more. The staff remembered us from back in August, and I think I could easily say they're some of the most genuine people I've met in any restaurant, and the tasting menu gave you a taste of all the good stuff without having to worry about what's coming next. Everyone's having a good time there. It's awesome. 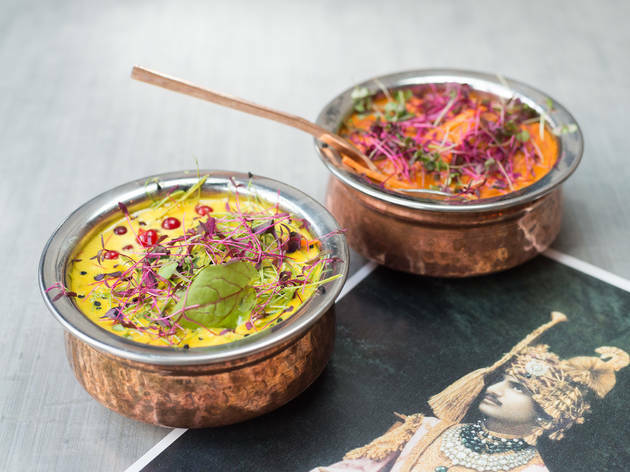 Babu Ji is not the place you come to for authentic Indian food. 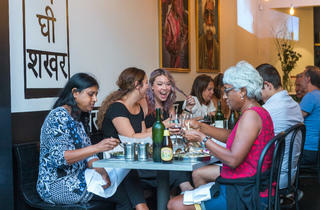 Babu Ji is the place you come to have tapas-style, delicious Indian food in a cool, fun environment. Any place that has a fridge full of self-serve beer and "White Girl Rose" is ok in my book. Although the food is great, it's definitely on the pricier side and the place can get a little cramped. I went on a Tuesday night and not only were we lucky to get a seat, but at points I felt like I couldn't hear my friends across the table. Even with this being said, you need to come here. Say it's someone's birthday and get the creamy, gritty ice cream-esque dessert called Kulfi to end your meal.